Every holiday season, I try to give as many DIY gifts as possible. DIY gifts are win-win, in my opinion. For the recipient, handmade gifts are more personal, and it’s obvious that a lot of thought goes into them. And as the gift giver, it’s nice to not have to make a mad dash to the mall during the busiest shopping season of the year! 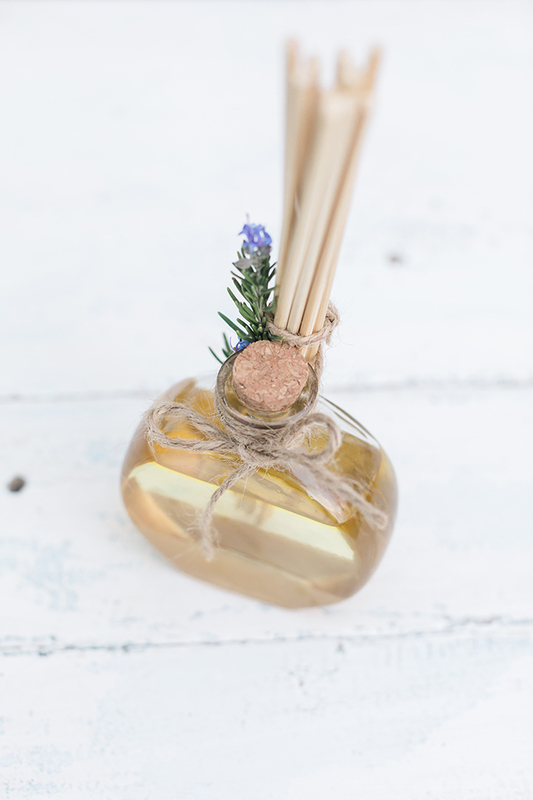 So if you’re looking for a last-minute gift idea that you can easily make at home, I present this DIY scent diffuser in a gilded glass bottle. I often buy candles and home fragrances as gifts, so I thought why not make my own this year? The nice thing about them is that you can make your diffuser using whatever essential oils you like. I suggested an almond/orange/clove blend below, but if you know your loved one likes a certain scent, you can customize this DIY for each person on your list. Now let’s get to it, shall we? 1. I began by decorating my glass bottle with a bit of gold spray paint for an extra pretty touch. 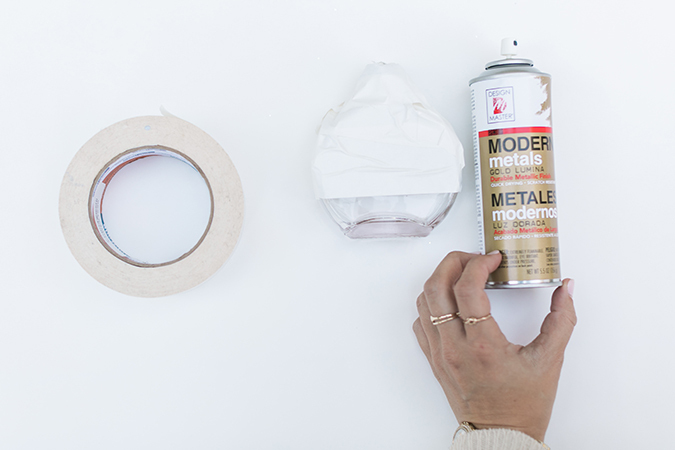 If you would like to create a similar design, tape off the top half of your bottle so that only the base will be gilded in gold paint. 2. 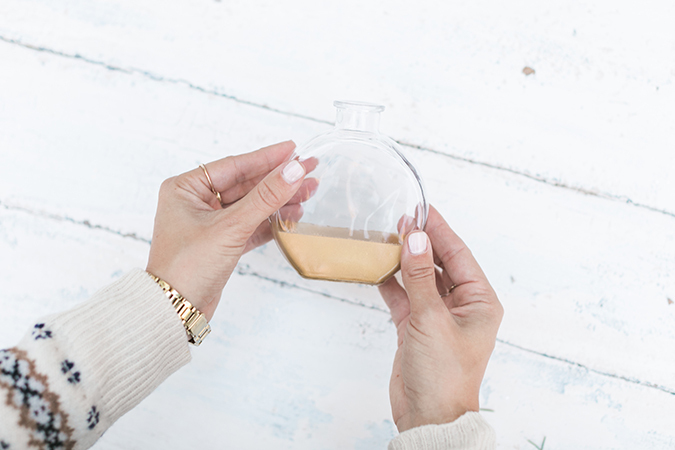 Spray a solid coat of gold paint on to your bottle (always do this outdoors) and allow it to dry (will take at least 1 hour). 3. Peel off the tape. If you don’t have a clean enough line, you can clean it up using a cotton swap dipped in acetone or rubbing alcohol. 4. 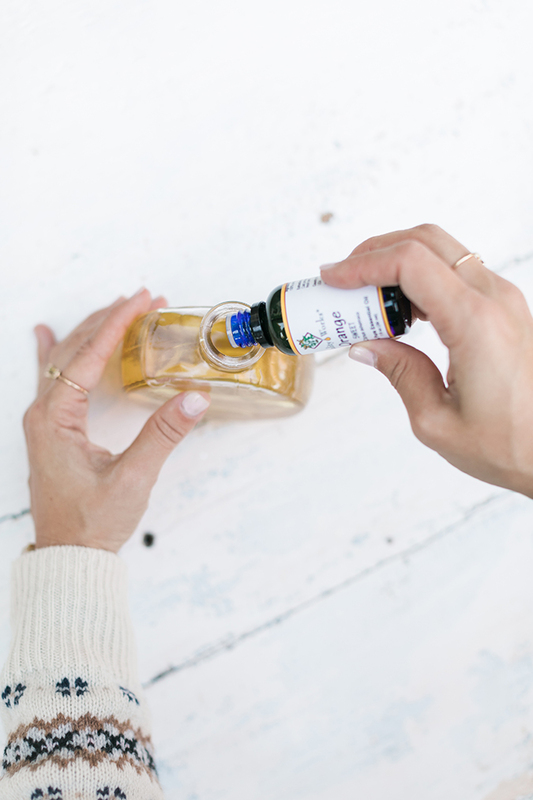 Depending on the size of your bottle, you will want to fill it about 70& of the way with almond oil, 20% with orange essential oil, and 10% of clove essential oil. We filled our bottle with about 7 ounces of almond oil, 7 drops of orange essential oil, and 4 drops of clove essential oil. 5. Re-cap the bottle. Tie the bundle of bamboo sticks around the neck of the bottle using a bit of twine. You can also add a sprig of lavender or other greenery like I did for a sweet finishing touch! 6. 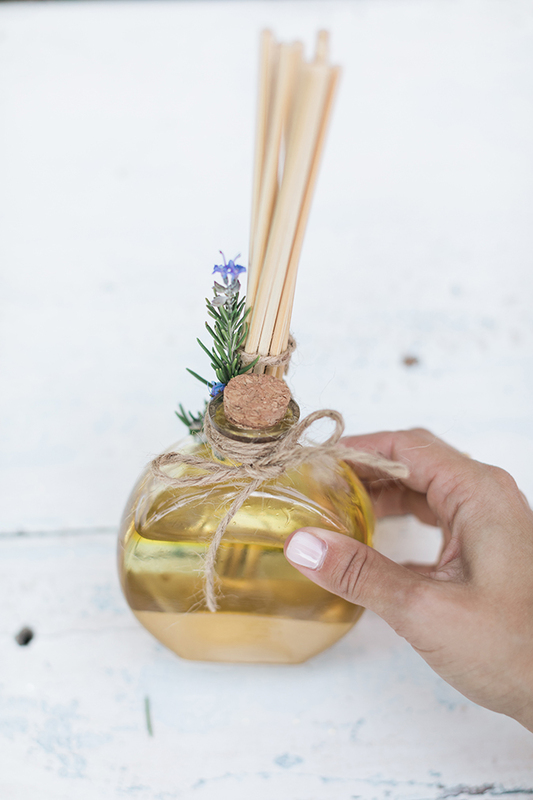 When it is time to use the diffuser, simple uncork the bottle and stick the skewers in the opening. 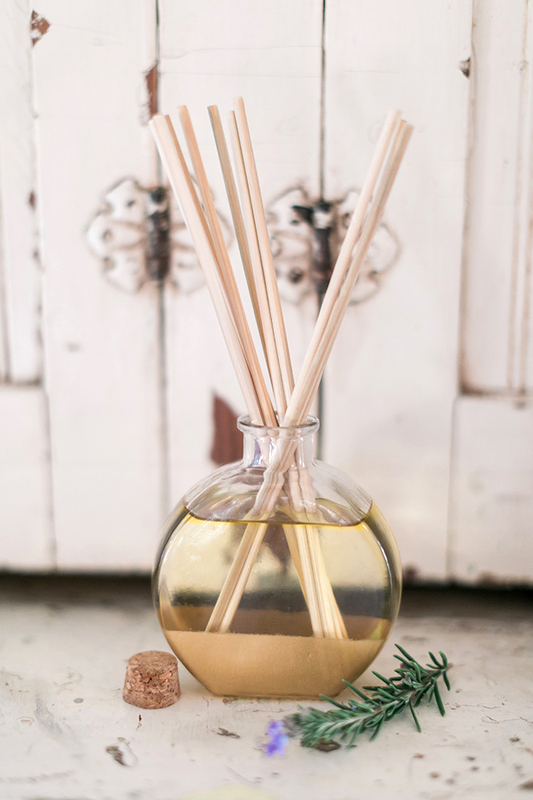 The skewers will absorb the oils and diffuse a lovely scent around the room. 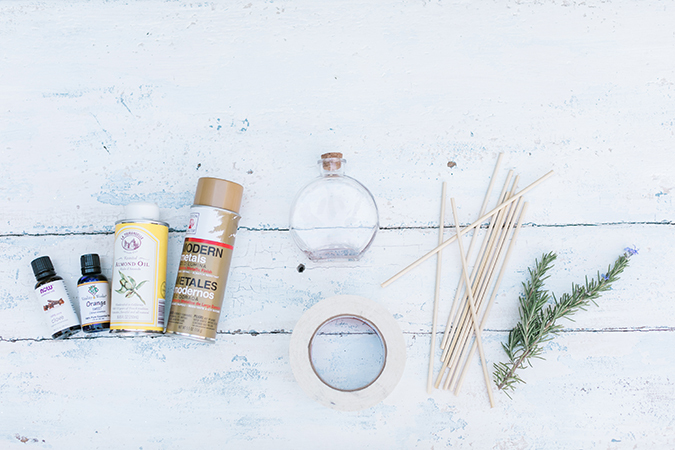 Are you going to give this DIY gift a try? Let me know what scents you use!